Rack Cards is rated 4.7 out of 5 by 9. Print rack cards any way you like with our custom options. 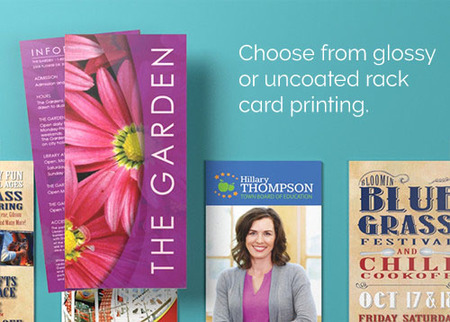 "PrintPlace rack cards are a great way to achieve a terrific impact with marketing collateral. The product is always delivered on time and the work is flawless." Rated 5 out of 5 by Tnvowels from Very nice! These cards came out exactly right and I received them very quickly. Rated 5 out of 5 by williamk from Great turnaround! Delivered as promised and with no hassle and at a great price! Rated 5 out of 5 by Talisman from They look gorgeous. High quality, great pricing, super fast turnaround. Rated 2 out of 5 by Amerika from Poor print accuracy I bought these a couple weeks ago. The proof looked great, not fuzziness and the margins looked correct. After printing, they came in and the back was not only crooked but also no flush with the edge. Rack card printing is an easy way to promote your business with high-quality, full-color printing on premium card stock. Hotels and restaurants place racks in their lobbies for tourists to find local information. Utilizing this space with rack cards is a popular marketing vehicle for the tourism and travel industries, spas, and more. A 4” x 9” rack card fits perfectly in these racks for tourists and hotel guests looking for information. We have many custom rack card sizes, paper types, and finishes so yours can stand out from the rest. Use our rack card layout templates to ensure that you lay your artwork out correctly. The layout templates can be downloaded as EPS, PDF, or JPG files. Follow the specifications provided below to set up your files. If your rack card will be placed in a traditional display rack, use bold colors, graphics and images to capture attention. Make sure your font is easy to read at a glance, so anyone browsing the rack knows exactly what you offer. Take advantage of PrintPlace’s high-gloss UV coating option to make your rack card stand out from the rest. Rack cards can be useful outside of hospitality racks as well. Churches can print rack cards for bulletin inserts to advertise special events or as visitor information cards. They can also be displayed in single racks around a store as flyers for an upcoming sale or as detailed information cards for specific products. Don’t think 4” x 9” is enough space? We have other standard sizes that fold down to 4” x 9”. Choose 7.875” x 9” (half-fold) and get 4 panels of information or 11.875” x 9” (trifold) for 6 panels. Want something smaller? We have a 3.5” x 8.5” option.